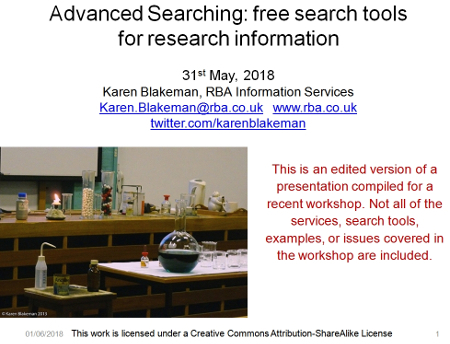 Edited highlights from my recent workshop on search tools for research information are now available. Please note that not all of the services, search tools, examples or issues covered in the workshop are included in this version. Slides can be viewed on Slideshare or authorSTREAM. Two of the services I cover in my workshop for researchers on alternatives to Google are Carrot Search and eTools.ch, and recently one of the people who had attended the session in April asked me to confirm what Carrot Search used to provide its main results. Strictly speaking, neither Carrot Search nor eTools are Google free: eTools is a metasearch tool that has Google as one of its sources and Carrot Search uses eTools for its web search. At the start of the year, Carrot Search offered 7 options for searching under tabs across the top of the search screen including Web, “wiki”, Bing, News, Images, PubMed and Jobs. Web search used eTools.ch to provide the results. The range of options has now been reduced to just three: the more transparently labelled eTools Web Search, PubMed and Jobs. This makes sense as the number of accesses to Bing via the api was always limited and I could never get the news or images options to work. eTools in any case is a metasearch engine covering 17 tools including Google, Bing and Wikipedia so the extra Carrot Search tabs did seem to be unnecessary. The full list can be seen on the eTools home page. This is where it gets interesting. It appears that Carrot Search does not just copy the results from a search on eTools. I ran a search on Brexit in Carrot Search and compared the results from eTools Worldwide and eTools United Kingdom. All of the sets were different so Carrot Search must be doing some additional analysis and processing. Carrot Search doesn’t just list the results but also organises them into topics or Folders that are displayed on the left hand side of the screen. These can be a useful way of narrowing down your search. Carrot Search offers two other ways of displaying results: Circles and Foam Tree. Both show the density of terms in the top 100 results and allow you to click on an area to add the term or phrase to the search. In addition I am finding that the Foam Tree is an interesting way of monitoring changes in news coverage and social media discussions on a topic, product or company. Yesterday, when I ran the search on Brexit, there was an area representing Theresa May. Today, that had been replaced with one for David Cameron. I assume that is because the news coverage has been concentrating on David Cameron’s last day as Prime Minister and his last Prime Minister’s Questions (PMQ) in Parliament . Later he goes to see the Queen to officially resign as Prime Minister. Tomorrow, with Theresa May as our new Prime Minister and a new Cabinet, the Foam Tree could have a very different structure so I shall be looking at it periodically to see if and how it reflects changes in events. As I mentioned earlier eTools.ch, which is behind the main Carrot Search web search, is a metasearch engine covering 17 tools. It also has options to select a country from a drop down list (Worldwide, Swtzerland, Liechtenstein, Germany, Austria, France, Italy, Spain, UK) and a language (All, English, German, French, Italian, Spanish). Either or both of these give you completely different views and opinions on a subject. It is a convenient way of gathering a range of foreign language information, especially on European events, and is easier than searching individual country versions of Google or Bing. The disadvantages are that the range of countries and languages is limited and many of the articles will not be in English. Nevertheless, I often find it helpful at the start of a piece of research as I get a general feel for the type and range of information that is available. Carrot Search and eTools.ch are just two of the tools that I cover in my workshop on alternatives to Google. If you are interested in finding out more, the next session is being organised by UKeiG and will be held in London on Wednesday, 7th September 2016. Further details are available on the UKeiG website. Bing has at last extended its date search options. Until recently one could only limit results to the past 24 hours, past week or the past month, and then only in Bing US. Bing has now added a custom range on a par with Google. The UK version of Bing has not had a date option until now but bizarrely has added the old, limited US selection. It seems very strange that they haven’t implemented the full US list. One can but hope that it will happen soon rather than in several years time, which is how long it has taken for this version to appear in Bing UK. This collection of Top Tips is a combined list nominated by those who attended the UKeiG workshop on “New Google, New Challenges”. The next UKeiG Google workshop will be run on 8th September 2016. Google tries to provide facts and quick answers to your queries at the top and to the right of your results. These are computer generated extracts from pages and several different sources may be used to produce an “answer”. They are sometimes misleading or completely wrong. At the time of writing, the answer provided for a search on frugivore is an excellent example. (It explains why your cat is so fussy over its food – it is obviously craving its 5 a Day!) Always go to the original source to double check the information, but this is not always provided by Google. Country versions of Google give priority to the local content. This is a useful strategy when searching for research groups, companies and people that are active or working in a particular country. Use the standard ISO two letter country code, for example http://www.google.fr/ for Google France, http://www.google.it/ for Google Italy. It is also worth trying your search in Google.com. Your results will probably be more international or US focused but you may see new search features or layouts in Google.com that are not yet available elsewhere. If Google insists on redirecting you to your own country version, go to the bottom right hand corner of the Google home page and you should see a link to Google.com. If there is no link then add ‘/ncr’ to the Google URL, for example http://www.google.com/ncr . The downside of using country versions of any search tool is that the prioritised information is likely to be in the local language. Your search history, which is recorded and available for you to view if you are signed in to your Google account, is used by Google to help personalise your results but it can also be useful as a record of past searches. If a user comes back to you having forgotten or lost the search and documents you gave them your search history should be able to help you find both. On any search results page click on the cog wheel in the upper right hand area of the screen and select History. You can then browse your history or select a date from the calendar (upper right and area of the History screen). This is an essential tool for making Google carry out your search the way you want it run. Google automatically looks for variations on your terms and sometimes drops terms from your search, which is not always helpful. To use Verbatim, first run your search. Then click on ‘Search tools’ in the menu that runs across the top of your results page. A second row of options should appear. Click on ‘All results’ and from the drop down menu select Verbatim. Google will then search for your terms without any variations or omissions. Note that Google will search for documents and pages in which the words appear in any order. If you are searching on the title of a paper place the title within double quote marks to force an exact phrase match. If Google still alters your search then run Verbatim. If you are carrying out in-depth research it is worth trying out Verbatim even if the “normal” Google results seem OK. You may see very different and possibly more relevant content. An important advanced search command that is available not only in Google but in many alternative search tools. Use the filetype: command to limit your research to PowerPoint for presentations, spreadsheets for data and statistics, or PDF for research papers and industry/government reports. The command must be all lower case and there must be no spaces between the colon and the command or the file extension, otherwise Google will treat the command as a searchable word. Also you must search for pre and post Office 2007 file extensions separately as Google does not automatically pick up both. Note that Google’s Advanced Search screen pull down menu for filetype: only searches for pre Office 2007 extensions. Use the minus sign immediately before a term to exclude documents containing that term, but use with care as you may lose valuable information. It can also be used with commands to exclude file formats or websites from your search. Personalise Google News (http://news.google.co.uk) page when signed in to your account and change what content is automatically displayed or add your own searches. Click on the Personalise button at the top of the right hand column. Click on the Cite link under a reference in Google Scholar and Google will give you options to import a citation in MLA, APA, Chicago, Harvard or Vancouver style into BibTex, EndNote, RefMan or RefWorks. Note that if the article is only available online you may need to add a doi or a URL, and the date of access. This is one I had not thought of but was recommended by one of the delegates as a way of using Google’s advanced search commands on Google Scholar instead of Scholar’s own. (I have not had time to test this one out myself). Google advanced search – get it right! When running advanced search workshops, and especially Google sessions, I prefer not to dwell on commands and search options that are no longer supported. They are gone and that is that, and it is far better to concentrate on how to get the best out of what is left. Of course it is unavoidable when your slides have been prepared several days before the event and Google decides to pull the plug on one of your favourite search features just before you start! Similarly I tend not to show “this is how NOT to use….” a command or incorrect syntax. It is often the incorrect format that one remembers. Recently, though, I have added slides to my presentations that cover both defunct commands and errors in syntax and format. The problem is that not only are many people unaware that some search options are no longer available but also some fact sheets and articles covering advanced search are getting it wrong. The recent Guardian article on top search tips for Google almost got it right but referred to the tilde, which was dropped in 2013, and did not really understand how Google automatically looks for synonyms and variations on a term (see my earlier blog posting Guardian’s top search tips for Google not quite tiptop). I have also seen a couple of recently produced Google fact sheets riddled with mistakes. The wonderful thing about Google is that it can take the most tortuous and error ridden search string and still come back with something that is sensible – most of the time. The downside of this is that one assumes the search query has worked as intended when in fact Google has totally rewritten the search for you. At some point, though, Google will rewrite the search in such a way that it brings back rubbish. So, it is important to know what commands are available and how they should be used. Plus (+) sign before a word to force an exact match. This was discontinued in October 2011 because Google intended to use it as a way to search for Google+ pages. That has been abandoned and it is now a searchable character. If you want to force an exact match search on a term precede the term with intext: for example intext:agriculture. I have also seen examples claiming that a plus sign between words acts as a Boolean AND. No, it doesn’t. If you do get different results when using + it is because Google is searching for that as well as your terms. This was withdrawn in June 2013 because not many people used it and it was no longer needed. Google now looks for synonyms by default. ‘thesaurus:’ sort of works because Google treats ‘thesaurus’, having ignored the colon, as a search term. So ‘thesaurus:eclectic’ will give you links to pages and websites of dictionaries and definitions that give synonyms for eclectic. It does not give you a straightforward list of alternatives in the same way that ‘define’ does. If you use thesaurus you have to go the websites in turn to view the synonyms. The asterisk (*) is a placeholder for terms between two words e.g. solar * panels finds solar photovoltaic panels, solar PV panels, solar thermal panels. It is NOT a truncation symbol. Again, you might think it is because Google ignores the asterisk and automatically looks for words that begin with the letters you have typed in. The example I gave in my earlier blog posting was a search on phenobarb*. I expected Google to pick up references to phenobarbitone. It picked up 76,000 results including phenobarbital but there was no mention of phenobarbitone in the first 100. Phenobarb without the asterisk picked up the exact same results. A search on phenobarbitone, with and without the asterisk came up with 241,000 results. I have no idea how or when Google decides to stop looking for variations on your string but it is obvious from the above example that the asterisk is not a truncation symbol. Commands such as intitle:, intext:, filetype: and site: must be all lower case and NO spaces between the colon and the search term. Capitalise the first letter or add a space after the colon or both and Google treats the command as an ordinary searchable word. I do understand why so many fact sheets, and presentations, show commands with an initial capital letter. You spend ages preparing your information and when you have sent off your slides for printing or converted your document to a PDF you discover that Microsoft Office has changed the format of the command. Because your search example is on a separate line with the command at the start Office, bless it, decides to auto-correct and capitalise the first letter. I know, it has happened to me! So, please, check and double check your support materials. Not always. If your search, as it stands, finds zero or a low number of results then Google will drop one or more terms that are usually shown as strikethroughs. In the above screenshot you can see that the third entry in the results has a “Missing: caversham” at the end of the snippet. If Google is dropping a term that is essential to your search then prefix it with intext:, for example intext:caversham. If you want all of your terms to be included, and without any variations, then use the Verbatim search option. If you are using a desktop or laptop run your search and then click on the Search tools option at top of your results. A second line of options will appear. Click on All results and select Verbatim. The layout and location of Verbatim on mobile devices will usually be different. Double quotation marks around phrases, titles of papers, song titles, famous sayings etc. works most of the time. But, again, if Google finds zero or only a handful of results it will ignore the marks. Google may also alter the spelling of one or more words within the double quotation marks. Use Verbatim if you are sure that the phrase is correct and you want to bring Google to heel. Google has NEVER supported full nested Boolean search. I still meet people who are adamant that Google does, but when pushed they admit that they often get unexpected results. You can , though, use OR for alternative terms and the minus sign before a term to exclude documents containing that term. Note that pages containing Belgium are included rather than excluded. If you really want to use full Boolean, then get thee hence to Bing. If you want to learn more about Google search Dan Russell, who works at Google, is currently running an online course on Power Searching with Google. Alternatively, if you want a more business or academic research and UK/European oriented workshop on what Google can do I am running an advanced Google workshop with UKeiG on April 13th, 2016. I have just been alerted by fellow search expert Alison McNab to an article by Samuel Gibbs (@SamuelGibbs) in the Guardian on top search tips for Google. I had to double check the date of the article because although it is OK for the most part it has got a few things wrong, one of the commands was withdrawn some time ago, and it has missed what I consider to be one of the most important Google search options. So let’s have a look at the tips one by one. Yes, placing double quote marks around words usually makes Google search for the exact phrase. However, Google does sometimes ignore the quote marks. Yes, the OR command does work when searching on alternative terms – most of the time. Make sure the OR is in capital letters. Tilde symbol (~) for a synonym search? No! Google withdrew it over two years ago because not many people used it. Google now looks for synonyms by default. If you precede a term with a tilde Google ignores it and carries on as normal. I’ve just tried several searches with and without the tilde and get exactly the same results. Yes. The site: command is one of the most powerful advanced search commands and enables you to search within a single site, for example site:www,gov.uk, or a type of site, for example site:ac.uk for UK academic sites. Yes, the asterisk can stand in for one or more terms between two words, for example solar * panels. No, it is not a truncation symbol. The example given by The Guardian is a search on architect*, which finds “architect, but also architectural, architecture, architected, architecting and any other word which starts with architect.” As with synonyms, Google searches for variations on a word by default. I ran a search on phenobarb* expecting Google to pick up references to phenobarbitone. It picked up 76,000 results including phenobarbital but there was no mention of phenobarbitone in the first 100 documents. Phenobarb without the asterisk picked up the exact same results. Excluding phenobarbitone by using the minus sign gave me 70,000 results. A search on phenobarbitone, with and without the asterisk came up with 241,000 results. This covers the commands intext:, intitle: and inurl:. All correct but intext: is especially useful in that it forces Google to include that term in the search. It is invaluable if you find Google dropping key terms from your strategy, which it does if you are likely to retrieve zero results or it thinks the number of results is too low. The related: command looks for similar sites, for example related:theguardian.com finds other news organisations. It works but only shows you 20-30 sites. Worthwhile using, though, if you want to broaden your search to other but similar organisations and only have one or two to start with. I wholeheartedly agree with this one. Once you have a few advanced commands under your belt you can really start to focus your search and retrieve more relevant results. I’m surprised that filetype: was not included. It is nearly always on the list of top tips that my advanced search workshop participants suggest at the end of the day. It’s a quick and easy way of finding presentations (filetype:ppt, filetype pptx), government documents and research papers (filetype:pdf) and datasets (filetype:xls, filetype: xlsx, filetype:csv). The major omission for me, though, is Verbatim. It is different from the rest in that it is not a command that you can type in. You have to run your search first. From the menu at the top of the results select ‘Search tools’, followed by ‘All results’ and then ‘Verbatim’. Use this when Google is wreaking havoc on your search by leaving out terms and using weird and wonderful terms that have nothing to do with your subject. Verbatim will search on all of your terms without dropping any or looking for variations and synonyms. If you are interested in learning more about advanced search in Google and other search tools, some of my past presentations and fact sheets are available at http://rba.co.uk/as/. If you are interested in attending a workshop my public access training schedule for 2016 is at http://www.rba.co.uk/training/ (more events will be added shortly).